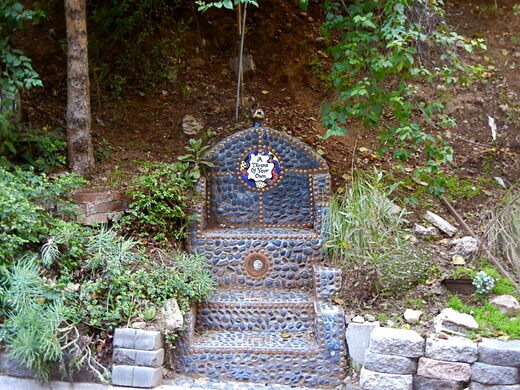 In 1991, Hollywood resident Gail Cottman purchased a small plot of land directly beneath her Hollywood Hills abode. Originally intended to house a patch of roses, Cottman’s flower garden soon grew into something much more spectacular, and magical, than she could have ever imagined. To build her garden, Cottman’s contractor, Manuel Rodriguez, placed her roses in a bed of concrete. 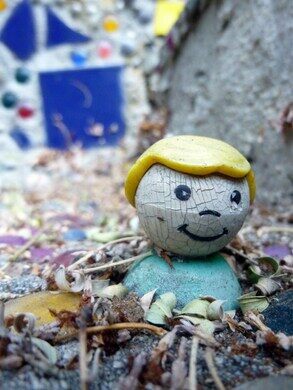 Noticing the dullness of the cement, Rodriguez decorated the concrete with tiles and beads to brighten it up. 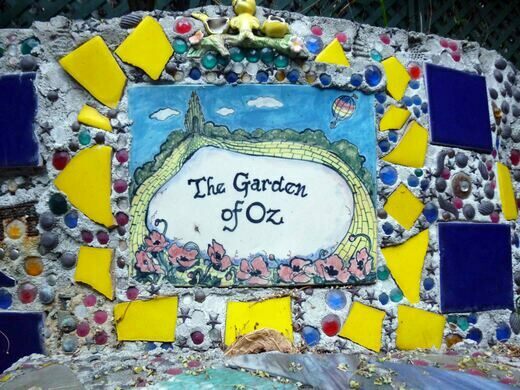 When Cottman noticed this new flowerbed design, it reminded her of one of her favorite movies, The Wizard of Oz, whose concept of “everyone is their own wizard” had inspired her throughout her life. 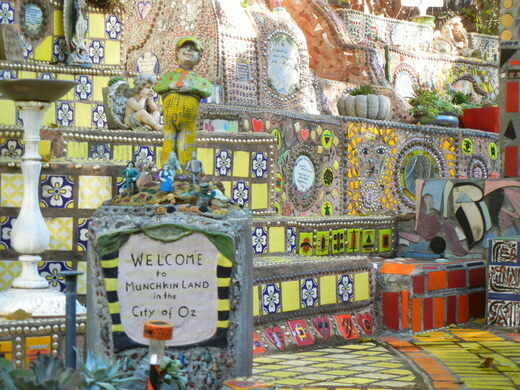 She used this inspiration to take her project to the next level, devoting her entire garden’s decor to “Munchkinland,” a plant-filled garden dedicated to the Land of Oz. Weaving through trees and shrubs, the yellow-tiled path twisting through the Garden of Oz forms the “Yellow Brick Road,” which directs the rare visitor through a landscape of thousands of shining tiles. 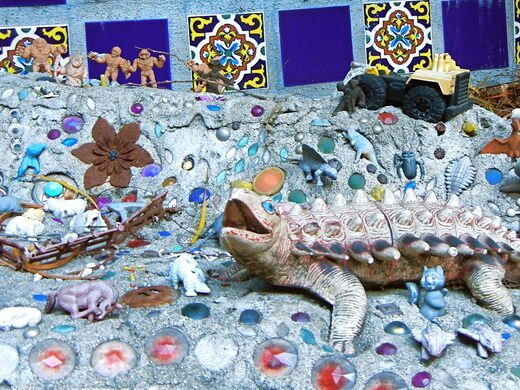 Featuring a crystal ball, the “Wall of Toys,” and a mailbox where you can send a letter directly to Oz, this folk art project features hundreds of plants, tiled staircases, and towering mosaics. There are multiple thrones in the Garden of Oz, each with a unique backstory. The garden features musical thrones dedicated to Elvis Presley and Duke Ellington and peacemaking thrones dedicated to inspirational figures such as Rosa Parks and the Dalai Lama. Also featured in Munchkinland is the Dorothy Throne, “A Throne of Your Own,” and a throne dedicated to Musako Morioka, Cottman’s Japanese friend who is a survivor of the bombings of Hiroshima. Cottman later visited Morioka’s homeland to create the “Garden of Us” in the center of Hiroshima. 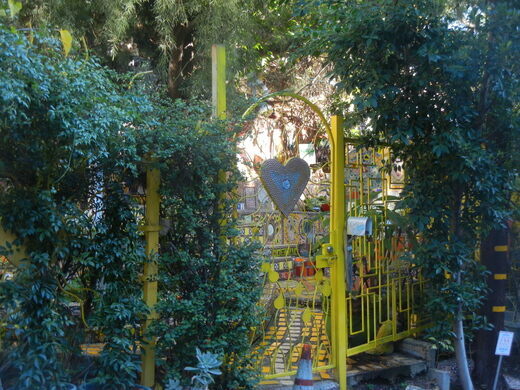 Although the Garden of Oz is not typically open to the public, Cottman has allegedly given the keys to all of the neighborhood’s children so that they have a direct pathway to a magical future. 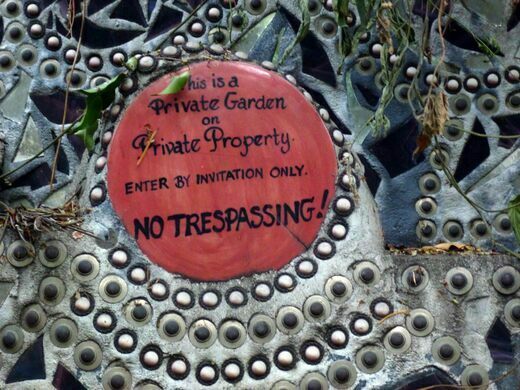 However, the adults wishing to see the garden can easily view it from the streetside.